After hearing everyone rave about the works of C. Robert Cargill, I finally got to read one of his books. My verdict when I finished Sea of Rust? The praise is justified. The novel follows the life of a robot named Brittle in a post-apocalyptic future. But Brittle isn’t a typical robot and this isn’t your typical post-apocalyptic story. In the world of this book, humanity’s fear of an A.I. takeover has indeed come to pass, but instead of us prevailing like all the movies always show, victory actually went to the machines. Now it has been thirty years since the war, and every last human is dead. Super computers referred to as the One World Intelligences control everything, and the last two standing have turned to fighting each other, determined to be the only mainframe left to reign over the minds of all robots on the planet. But not all robots want to give up their individuality and be part of the collective. Those who wish to retain control of their own programming and memories are left with no choice but to hide, then run as their cities and safe havens are invaded and consumed by the OWIs and their countless drone-like facets. This is how we meet Brittle, who used to be a caregiver model back in the day when robots still had humans to care for. Now though, she is a lone scavenger eking out a precarious existence in the large desert known as the Sea of Rust, selling whatever spare parts she can pull from other broken bots she comes across in her travels. Old components are always in demand, and Brittle herself is one corrupted core away from certain death, with her own parts becoming increasingly harder to find. Then one day, our protagonist’s greatest fears are realized as she suffers damage to an irreplaceable, irreparable piece of her hardware. Brittle knows her days are numbered, unless she can find the part she needs to save herself. As it so happens, she is offered a slim chance of survival by a group of independent robots needing her services as a pathfinder through the wasteland. Their mission is secretive and dangerous, but Brittle is left with no choice but to accept their offer in order to avoid her own inevitable shutdown. What I loved most about Sea of Rust was its premise. Books about machines that become the dominant intelligence on earth and seizing control of the earth away from humans are a dime a dozen. So are post-apocalyptic novels, for that matter. But here’s a book that combines those two ideas and twists them into something fresh. I was also immediately taken with our protagonist. The story opens with an encounter between Brittle and another broken down robot she is hoping to cannibalize for parts. While I doubt this intro was supposed to make readers feel sympathetic towards her, what it does do is show us what makes her tick. It’s a bot eat bot world, and only the toughest survive. Brittle is just being logical and pragmatic, as machines are wont to do. But although she has long since evolved past her caregiving programing, the memories of her past remain, as hard as she tries to suppress them. Most of this first section of the novel is dedicated to exploring that history, examining Brittle’s relationship with her human owner as well as chronicling how the robots first rose up and eventually took over. This resulted in a slow and gradual introduction, but it was one filled with rich world-building and fascinating insight into our protagonist. My only regret about this book is less of a criticism and more of just a casual observation. 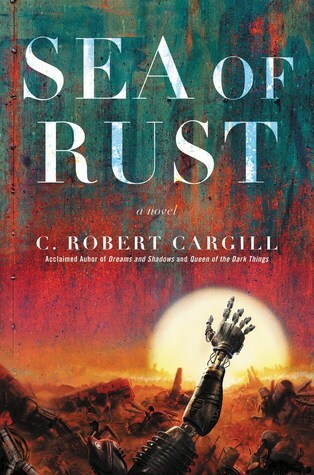 What originally drew me to Sea of Rust was the prospect of reading a story from a robot’s perspective, but of course, the whole point of the novel is that as an AI grows smarter and achieves sentience, it also becomes more human. Robots may have replaced humanity as the dominant intelligence, but they are not infallible, and ironically, in achieving the ability to feel and think for themselves, they have also adopted very human behaviors, including coming up with their own rituals to follow or identifying with a certain gender. In time, they have even inherited their creators’ faults. They wage war. They destroy the planet. They oppress and subjugate their own. In essence, there’s little difference between reading about Brittle and reading about a human protagonist. At times, I even forgot we were reading about robot characters, which was no doubt Cargill’s intent, but I did wish we could have seen more of the their “machine-ness” come through, as that would have set this book apart even more. In the end, Sea of Rust was quite the thrill ride through a very different post-apocalyptic setting. Weaving a story filled with both action and emotion, C. Robert Cargill has written a novel that is meaningful, unique, and entertaining. I’ll definitely be reading more by the author. It’s a very different robot story, so maybe it could work! May have to add this one. Love that cover. I remember seeing an earlier review and it seemed interesting to me that the robots “win”, take over the planet, and then some of then end up having to run from the OWI’s themselves- just like the vanished humans! Kinda dovetails with your point about the robots taking on their creators characteristics. Sounds fascinating. I thought that was interesting too! Like Skynet prevails and destroys the last remnants of human resistance, down to the very last survivor. Pretty grim! I think I have a couple of his other books on my tbr. This was the one that really made me sit up and pay attention though, the blurb really intrigued me! One really weird thing I noticed is Brittle is a male robot in the UK version. I noticed that as well, in the UK edition the blurb refers to Brittle as “he”! I had wondered if it was a typo, but now I know it wasn’t. Interesting, I wonder why the differences between the two versions? Me too, I thought it wouldn’t be out in the US until later this fall! There is something striking about that cover. This is already on my wishlist – wonder if my library has it? (running off to see). Yep, I completely agree with everything you’ve just said. And, of course I also really enjoyed this – it is a really great concept. I would have liked a little bit more of a distinction between the robots but it wasn’t something that put me off the book. Really well written and I loved Brittle. Yeah, I really enjoyed it too! Brittle was amazing! I’m glad you enjoyed this, too. 🙂 I completely agree that the robots came off as human much of the time. It was still a fun read, though. Yeah, I was drawn to the prospect of reading about robot characters, but they ended up feeling human anyway. Not that I minded too much though, like you said it was a fun read! I’m so looking forward to reading this. The cover was the first thing to draw me in but everyone’s been saying amazing things about the story too. Yay! Besides the gender of Brittle, I wonder if there are other differences in the text between the UK and the US? As to the differences between the UK/US edition, I’ve show before that books can ingest one editor in the UK and another in the US, leading to a single statute title being fairly dissimilar in each food market. Not that I minded too much though, like you said it was a play show! I think that’s really cool! Thanks for the info!